I am a new owner of a 1987 300sdl and it starts great idels a little rough however the problem is no power untill 2500 rpm or untill you get up to 20-30 miles per hour. It smokes dark rich smelling not oil. no real oil consumtion. anyboby have an idea for me to start? Iam new to the deisel (plenty of gas powered experience) HELP? I may have some of this backwards but it appears you may need more air. On a dust free road, remove the air filter and see if things change. 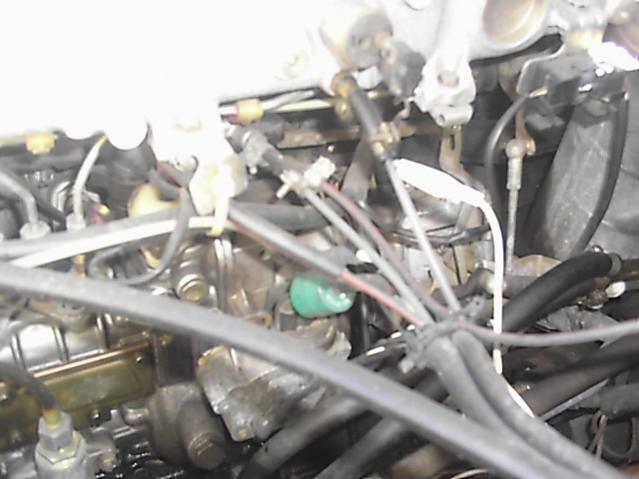 Make sure the tube in the photo is clear, as well the hole going into the intake manifold. I have a white test lead clamp attached to the tube. Are you up to date on your fuel filter status? Had the same problem. Injection pump was bad. Thought it was the delivery valves, replacement did not help. Check the basics, including timing of cam and pump. could be water in fuel.I run Iso Heet for diesels.2 bottles if bad,or once a month. I agree. Sounds like it's starved for air. How's the turbo working? pull the manifold exhaust off after the turbo.if it seems to run much better look at this link. Most enlightening! The pics of the inside of the cat are amazing. I'm a amazed the car would move at all. Been telling 603 guys for years to gut the cat under the car. could it be the turbo waste gate valve is jammed open? Or the turbo bearings are tight and not spooling up properly (not so likely). It is not a catalytic converter is it? It is called a trap oxidizer i believe,or is it a particulate filter? Either way it needs to go.Going to do this mod soon. Did these vehicles come with that on the car before or after the dealer took off the trap in the engine bay? You might try tweaking the ALDA (do a search, you'll have days of reading). It made a big difference on my 124 (603). Not sure if yours has one or not but the banjo bolt at the back of the intake can get clogged with soot and not send the proper boost signal. These are just a couple quick, cheap things to look at. Well its technical name is a Diesel Oxidation Catalyst I believe... sort of like a soot trap type of deal. Trap Ox was mounted under the hood. Then when that proved to be a very poor idea, the trap ox was deleted and the DOC was installed below the car. There are still 603s out there with the Trap Ox, but this is not too common. Supposedly this was only on '86 CA cars and all '87 cars. I do not know about the '90+ cars, never looked close when I had seen one in person.